I know that summer time isn't the season you generally think of making a big pot of chili, but it is one of Daddy Drew's favorite meals, and it happens to be the very first recipe I wrote, so I thought I would share it with you. It has a bit of a kick, but you can easily tone it down a bit. In a large pot, brown ground beef with chili seasoning. 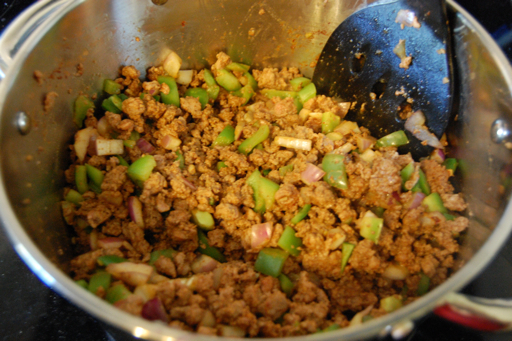 Add diced onions, bell peppers and jalepenos and cook until beef and onions are done. 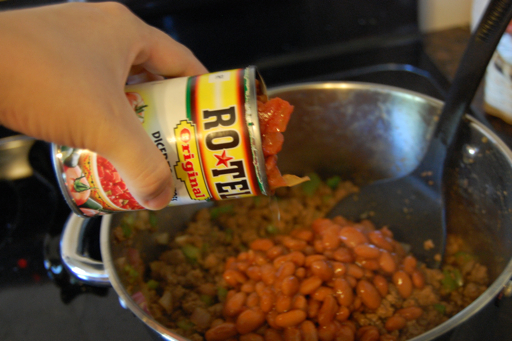 Add beans and Rotels with liquid and crushed tomatoes. Stir well. Add 1/2 bottle of beer. Stir well. You can add more or less depending on your desired consistency. Add spices. I recommend sprinkling them in. No need to waste dishes by actually measuring. Serve with corn bread muffins if you wish.